When the Coen brothers, Steven Spielberg, and Tom Hanks teamed up to make Bridge of Spies, it was a sure bet that audiences would be engrossed. What I hadn’t anticipated is that Mark Rylance would create a character of such complexity and subtlety that it will surely rank at the top of this year’s most memorable performances. For anyone too young to remember it, this story began in 1957 in the era of corded phones, electric fans, and brass razors and remained in the headlines into the ‘60s. Without explanation, we meet Rudolf Abel, a quiet sixty-something artist who lives alone and spends his days painting with occasional forays into city streets to pick up carefully hidden instructions as a link in the Soviet spy chain. The truth of the story adds great strength to the movie. 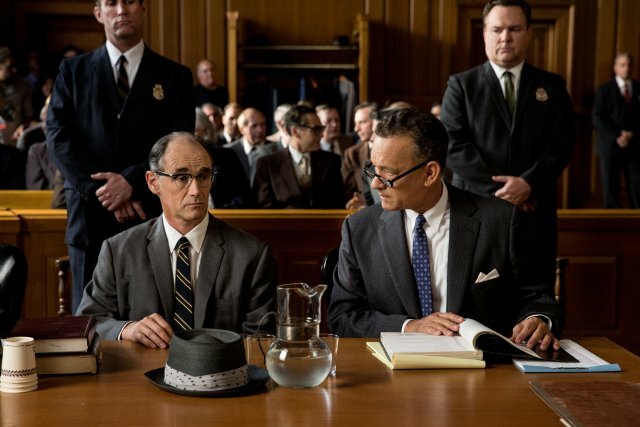 Arrested by the FBI, Abel (Mark Rylance) is turned over to Jim Donovan (Tom Hanks), a successful insurance company lawyer with no political experience. Under the direction of CIA, Donovan is to be the architect of Abel’s defense. The plan is designed as proof to the world of the American promise of a fair trial for even the most detestable criminals. Jim Donovan rejects the showboat defense and instead injects himself deeply into the case. Enter Francis Gary Powers, American U-2 pilot flying over Russia under specific orders not to pull his parachute cord in an emergency. He is ordered to kill himself before the Russians can torture him into revealing the secrets he carries. He pulls the cord. And so the stage is set for the exchange of Abel and Powers on the Glienicke Bridge in Germany. Will it, or won’t it take place? Suspense builds as we in the audience try to sort the clues that crop up in short scenes without explanation. Tom Hanks is a master at creating a man decent to his core and determined to do an honorable job in spite of the simple minded cruelties proposed by both the FBI and the CIA. Amy Ryan is fine as the appropriately dutiful ‘50s wife wearing the uniform of the time: dark red lipstick and a perfect pageboy. The story turns not on innocence or guilt but on the subtlety of the relationship that develops between Abel and Donovan. Friendship? Not quite. Loyalty to principle? Absolutely. Respect from each for the honesty and national loyalty of the other? Yes. With few words and great depth, Mark Rylance manages to seed a relationship rooted in trust between two men who by all common measures should be enemies. All this comes in sharp bursts without emotional or verbal cliché. The intricacies of the conclusion hold the audience in suspense right up to and through the closing screen comments. Spielberg, the Coens, Hanks, and Rylance have blended their artistry in a truth based thriller that never lets us rest for a second. And best of all, they have made us think as we watch. This review was posted on October 25, 2015, in Biography, Drama, History/Biography. Bookmark the permalink.